Bone Broth is becoming quite trendy at the moment! The benefits are being touted all over the place.place. I’ve talked before about the benefits of broth here and here, but even so, let’s not go overboard! There is little evidence to back the claims up, and studies that have been done are using nutrients from the broth in a supplement, so not the same (read here for more info). Nonetheless, I love it. For the simple fact that it’s cheap (unless you buy it out, then it’s suddenly not anymore!) and lets me add extra protein to other dishes such as soups, I like making it. And although I’m sure a lot of the claims are over-hyped (you probably won’t look 21 again from drinking collagen!) it doesn’t mean there’s not some wisdom in it: many cultures give new mums bone broth as part of their post natal diet, and I’m sure they have their reasons. So, my recipe. I always do broth in my slow cooker, as I leave it overnight and my stove switches itself off, but you can do it in a stock pot on the hob. Just bear in mind you need to leave it for a while: I aim for 24 hours with bones this big (smaller bones like chicken don’t need as long). 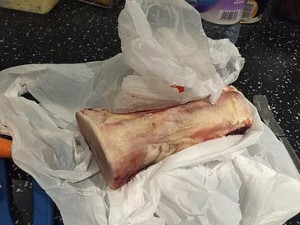 First, I put this bone, which was £1.50 from the local butcher, into the oven for about 40 mins on 180 degrees. This is for 2 reasons: first, it gives the broth a much nicer flavour (and smells lovely! ); second, roasting the bone helps it to break down so you get more nutrients in your stock. This is a marrow bone, which is nutrient dense and has a great flavour, but you can use any bones you like. Bones like hooves or knuckles are more gelatin rich, and have more collagen and glucosamine in them, so great for joints and postnatal recovery. 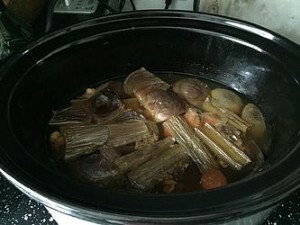 Then I put it in the slow cooker (or stock pot), cover it with water and add about a tablespoon of cider vinegar or lemon juice (again this helps to break the bone down), and I also add a tablespoon of orange juice. I read somewhere that this helps with drawing out nutrients too, and I got a really nice flavour when I tried it so have stuck with using it! Depending on what you’re using it for and how strong you like it, you can take the lid off and reduce it down when you’ve finished. I like to do this and get a ricker flavour. Then just cool and drain through a sieve. 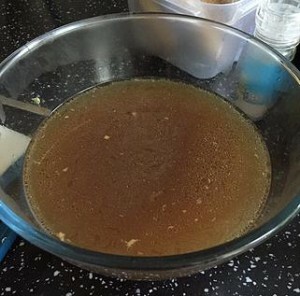 You can change the concentration of the gelatin in there, which is visible on the consistency when the broth is chilled, by decreasing the ratio of water to bones. Less water and more bones will result in a higher concentration of gelatin, so the broth will be more jelly-like when cold. 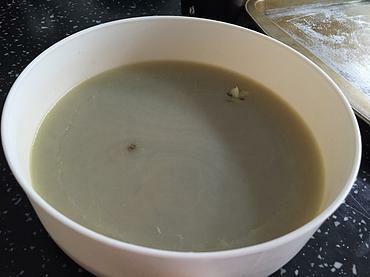 Sometimes I return the broth to the heat once I’ve drained it and reduce it down to get a stronger flavour. I often divide it up into 500ml containers and freeze some for stock. You can use it in casseroles, or for soup, or just heat and drink it. I know this doesn’t look hugely appealing, but once you’ve warmed it it’s runny again. https://www.vanessabarker.com/wp-content/uploads/2015/11/e56a76_77900f0816fe42bc98eea2bff4b928c0.jpg 277 370 Vanessa https://www.vanessabarker.com/wp-content/uploads/2015/11/logo.00.jpg Vanessa2015-05-07 14:17:462015-12-27 19:04:18Recipe: Beef Broth. One day I’ll blog about a recipe and not start by talking about my children and their eating habits. Not today though. I’ve called them fussy before, but it’s not so much that they refuse to eat everything, it’s that they’re irrationally selective about what they eat. They’ll refuse something plain like a cheese sandwich, and then want scotch eggs or broccoli smoothie. Where the hell does a request for broccoli smoothie come from?! What works one day won’t work the next, and I swear they’ve organised themselves as a tag team, where when one eats dinner the other refuses. So whereas sometimes they’ll eat their veg, I often have to get creative, and in this case it’s with a veg packed passata. (Confession- Ella’s Kitchen are the creative ones here, this is from their cookbook). I can use it in recipes like this chicken cacciatore to add extra veg. I use this as a guide, I had extra butternut squash this time and didn’t weigh the peas. 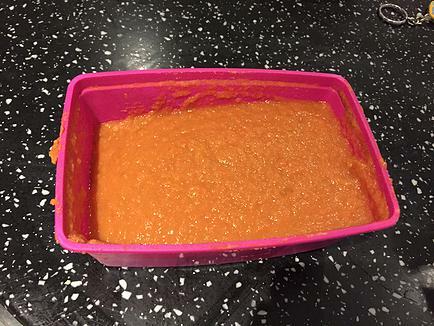 Cool the squash and carrot until soft then add baked beans and blend with a hand blender. Return to heat, add canned and fresh tomatoes and simmer for 5 mins. Purée again, et voila! This is roughly 500ml, and I had 2 of these which I froze, and enough to use to make a ragu straight away. It really didn’t take that long and produced a decent batch. The colour isn’t as appealing as a shop bought pasta sauce/ passata, so the ragu wasn’t as red as when I’ve made it before, but other than that it’s pretty good. If I were to have it on its own with pasta I think I’d need to add a bit of seasoning and herbs though. I’ve called this chicken stock, but that’s purely because that’s how I tend to use it. But broth, soup, stock; it’s all the same really. I’ve written about the benefits to healing diastasis recti here, but this stuff really is packed with of all kinds of goodness. 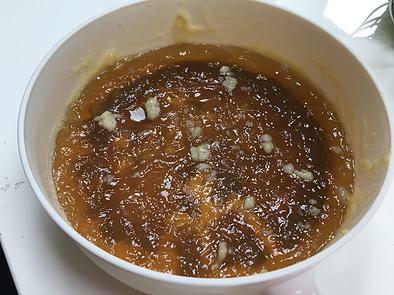 It’s full of gelatin, which is a digestive aid, and the collagen in it is the building block of tendons, ligaments, and cartilage, and it promotes healthy skin and hair. Although be aware- some of the benefits of collagen are a bit over-sold: you can’t absorb it whole, but the protein from the amino acids it breaks down into is crucial for any form of healing. They don’t call it Jewish penicillin for nothing! Chinese Medicine practitioners use it to treat illness, the Victorians’ drank ‘beef tea’, and don’t forget Russian borscht! And it’s not just tradition: this study by Dr Stephen Rennard at the Pulmonary and Critical Care Medicine Section of the Nebraska Medical Center in Omaha, Nebraska, found it has anti-inflammatory properties which help to ease symptoms of upper respitory tract infections and colds. I’ve been making my own chicken stock for a while though, purely as a way to use leftover bones after having a roast chicken, and because it’s an easy way to make stock for other recipes, instead of using store-bought stock cubes. 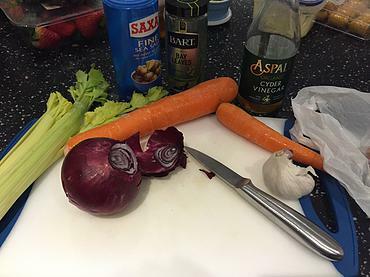 I add a selection of veg. Usually a celery stalk or 2, a few onions, carrots, garlic, make leek, then salt, and I quite like thyme. In the morning strain the liquid. The longer the better when it comes to cooking time, as it gives the bone more time to break down. When it has chilled I scrape the fat off the top, then store in the fridge for 3 days, or in the freezer for a month or 2. I usually have 1-1.5 litres worth which I divide in to containers. I have also shared a recipe for beef broth here. Recipe: Slow Cooker Chicken Cacciotore. 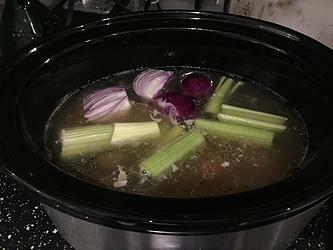 I love love love my slow cooker, and this is one of my go-to recipes for it. My day always feels a bit happier when I know I have a yummy dinner already cooking, partly because I’m looking forward to it, and partly because I feel a bit smug for being organised. It also means I don’t have the ‘witching hour’ hanging over me, when I announce I need to go and cook and they need me to play with them right now and hang off my leg pleading ‘stop cooking mummy’ (I try not to take that too personally). And if I do play and postpone dinner it only gets worse as their hunger builds. So, the burning question: DID MY CHILDREN EAT IT? One ate the chicken. The other refused, and then his gran gave him some bounty bar, so any hope of later success was dashed. 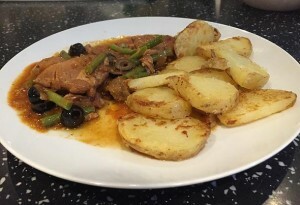 In the past they have enjoyed this dish though (with the offensive olives removed), but it seems to be more popular with mash, despite the fact that these potatoes were all buttery and crispy and yummy. As with most slow cooker recipes, I do either 8 hours on low or 4 on high, and this all went in after breakfast. Couple handfuls of sliced black olives. Green beans as desired. Or peas. Heat some oil in a frying pan (I use coconut oil) and brown the chicken. Put in the slow cooker. Fry the onion and garlic for a few minutes, then pour in the wine and reduce by half. Add the herbs, sugar and paste. Transfer to the slow cooker and stir in the stock (I used homemade this time, from the freezer, so I’ve no idea if I actually used 80ml, but it looked about right) and passata (again homemade). Add the olives and green beans (or peas. I think the kids prefer peas) about 10 minutes before you serve. Season to taste. I usually serve with mash, but I fancied crispy potatoes, so I sliced and boiled them before tossing in flour and frying them in butter. https://www.vanessabarker.com/wp-content/uploads/2015/11/e56a76_f5637069aef24566b4b08020589f01e1.jpg 403 590 Vanessa https://www.vanessabarker.com/wp-content/uploads/2015/11/logo.00.jpg Vanessa2015-03-23 11:37:432015-12-24 11:16:44Recipe: Slow Cooker Chicken Cacciotore. They also like to work as a tag team: if one does deign to eat my lovingly prepared food, even enjoy it, you can guarantee the other won’t. Except for these Fishcakes. Ah, Annabel Karmel, for this alone I love you. As a personal trainer I should probably talk about the benefits of oily fish for a bit, yada yada. But I’m not going to. The fact that these are healthy is great, but I would make them anyway BECAUSE MY CHILDREN LOVE THEM! Here’s the recipe. 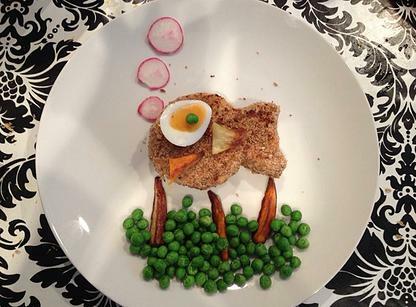 I have tried other fishcake recipes, but none come close. Look, they even come out looking like hers! I’m so proud, I didn’t even have to use Instagram to make this look attractive. The recipe requires you make the mixture and leave it in the fridge for 4 hours. It can be left longer, so I tend to make it before going out in the morning, as I’m often too busy at lunchtime. You could just as easily do the prep the night before. Presentation is key. Here I have deviated from Annabel’s recipe and used sweet potato and parsnip chips for the smile, fins and coral. I have also used sugar snaps. I put everything in individual bowls on the table and they can decorate as they like. As a bonus they keep well (although they lose their crunch) and are great for picnics. My youngest even ate one for breakfast once. If only I could make burgers shaped like cows, then I might be able to replicate my culinary success with another dish. As it is I anticipate another ‘yuk’ this evening. https://www.vanessabarker.com/wp-content/uploads/2015/11/e56a76_4d26f0746ae24ad29d8a1c4b2d59ac94.jpg 307 416 Vanessa https://www.vanessabarker.com/wp-content/uploads/2015/11/logo.00.jpg Vanessa2015-03-15 11:37:142015-12-27 20:04:35Best Fishcakes EVER.